Do I have (or) Have I got … news for you? In the beginning it was easy. No one had to worry about the choice between teaching Have you got… ? or Do you have …? for possession. 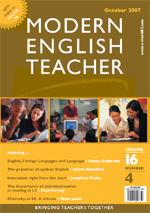 When I started teaching, the textbooks avoided the question by teaching plain Have you…? OK, it was stilted, but at least it united British and American usage: neither used it in conversation. By the seventies, structural courses in British English introduced possession with Have you got …? The classic ELT writer’s bible, English Grammatical Structure (Longman, 1975) by the four leading ELT authors of the day (L.G. Alexander, W. Stannard Allen, R.A. Close and Robert O’Neill) defined six levels for teaching structure, each with thirty stages. They worked out meticulously a logical progression from simple to complex, and have / have got was introduced after the verb to be but before the present simple. They gave both possibilities: Have you got…? and Have you …? Functional courses reinforced Have you got …? which was the accepted form in British English. When you did an American version of a British textbook, as I did with Streamline, you switched to Do you have …? There are problems with have got in American English. The first is the tendency of people to say I got … for possession, or to voice the ‘ve so softly that they might be saying I got …. An interesting textbook example comes from the British series English File where the American Roy Orbison song You Got It is transcribed for teaching as You’ve Got It, which is not the original title, nor what Roy Orbison sang. The second problem is inconsistency in matching responses. Years before the corpus was available, I did my own TV survey on American programmes. I found some confusing bits of dialogue. Punk Anderson: Have you got any answers? Bobby Ewing: No, I don’t. Agent: We’ve got enough to nail this guy. You’ve got ten minutes to make a decision. A: Do you have to go now? B: Yes, I’ve got to give in my notice. B: No, I don’t got it. I’ve got some bad news for you. We have your daughter. Norton is Irish, Waters is American. Graham Norton: You’ve got a book out. This switching follows into British English. A: (describing a moth) Look, it’s got tiny wings! B: Yes, it does, doesn’t it. Elvis: (brusquely) How much time’ve we got? Elvis: (politely) Pardon me. How much time do we have? Elvis was definitely switching to a more polite mode! The more formal status of Do you have …? is apparent on a Donald Fagen album, The Nightfly. The printed lyrics are Do you have …? but he sings Have you got …? In the 1990s, the British Headway series switched from teaching Have you got …? for possession at Elementary level to teaching Do you have …? A common characteristic of this and similar (dare I say cloned?) books was teaching the present simple early, before fully exploiting to be, so that it can be argued that Do you have …? was easier, following the same pattern as Do you live in…? / Do you travel to…? and so on. It could also be argued that it was satisfyingly mid-Atlantic, and did away with the necessity of first teaching Have you got …? for possession, followed later by Do you have …? for routines (When do you have lunch? Do you have a bath or a shower in the mornings? etc). The counter-argument is that if you teach possession before the present simple, it’s easier to manipulate have as an auxiliary for beginners than it is to introduce the do / does auxiliary. Also, students who have started with Have you got … / Has she got …? will have no manipulative surprises when it comes to the present perfect. It’s true that you then have (got) to teach Do you have …? for routines, but this comes in later with other routines, and at that point you can show students that both Have you got …? and Do you have …? are acceptable for possession. Eventually they will have to know both. In many ways, I see a structural distortion in the (many) textbooks that start a series in the middle at Intermediate level, then move up, then move back to Elementary. Because they’ve designed their early level syllabus backwards, they end up with a “subtraction syllabus.” i.e. How can we make the new level easier than the one before (and above)? This continues into the (many) series that do write in logical order from Elementary upwards, but then decide they need a “Level Zero” below Elementary, and have to slot one in. It means that having taught (say) have got at pre-intermediate, or elementary level, they have to think of something apparently simpler. I only ever work with “addition” syllabuses. That is you teach what they need to know in the clearest fashion at beginner level, then move upwards. I’ve had to consider the arguments every time I’ve worked on a new beginners course, and my decision last time around with IN English was to teach Have you got …? first. Such was the influence of the global impact of Headway on editorial thinking, that one editor suggested we teach Do you have …? instead, purely because “teachers expect it because Headway does it.” If you look at the appendix, Headway was out on a limb here. Sometimes I work in American English, so then it’s Do you have …? initially. But … and there’s always a but. My younger son took a degree in Physics, then set off to study martial arts in China. He avoided all requests to teach anyone English for a year, but at last agreed to swop English lessons for Chinese lessons with his instructor. We duly sent him copies of both In English Starter and New American Streamline. I went through the explanation of British and American versions. I explained that it was stilted and lower frequency than the other two. What some British English courses taught. The examples are given in the negative form. Starting Strategies Longman, 1977 Can I have …? Apologies if your favourite is not listed. I was highly selective, and all those chosen are international courses. People do get so angry about grammar!